If you’re visiting Bali, Indonesia for the first time, these are the places you should visit for food. Most people plan their first trip to Bali for the sun and beaches but I would definitely go back for the amazing food. Known for its surf-worthy beaches, spiritual retreats and endless outdoor activities, Bali is als.o a foodie heaven if you know where to look. Not only will you find authentic cheap local fare but plenty of dining options ranging from a casual cafe brunch, great tex-mex, quality local coffee, enticing patisseries and fresh seafood! Regardless of your budget, it’s possible to have something different and exciting every meal and still afford daily cocktails! 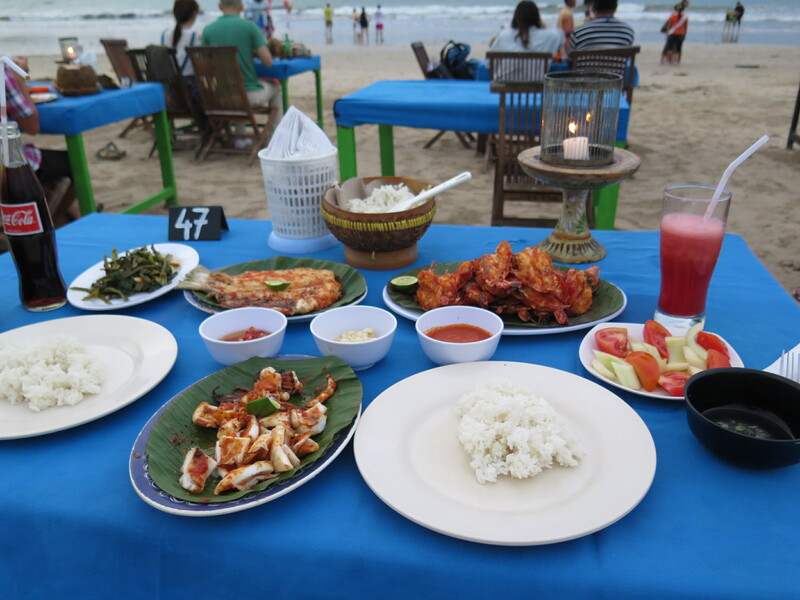 Here’s my take on places to eat in Bali especially for first-time visitors. Also known as Balinese Suckling Pig, Babi Guling causes hungry pork fanatics wet dreams. It’s one of the Island’s most famous local dish, where a pig is seasoned with local herbs and spices then roasted whole. The tender meat is served on rice with stewed vegetables, pork sausage, fried pork meat and most importantly the crispy skin! There are many places that sell Babi Guling but the most well-known chain going by the name Ibu Oka is a must eat for this dish, and also has multiple outlets. Their Spesial (Special) set meal inclusive of all the items mentioned above is a pocket friendly 55,000 IDR. ($5.50 SGD). Best visit them for lunch as they have early closing hours and tend to sell out! Coffee or Kopi in Bali unlike other parts of Indonesia has traders from Lombok to thank, as they brought the first coffee plants to the island. The majority of coffee grows in the north eastern region of the island due to the fertile volcanic soil and ideal climate. An array of cafes and specialty coffee joints in Bali serve up top notch joe in all forms that will only set you back around $2 – $5 SGD (19,700- 50,000 IDR.). 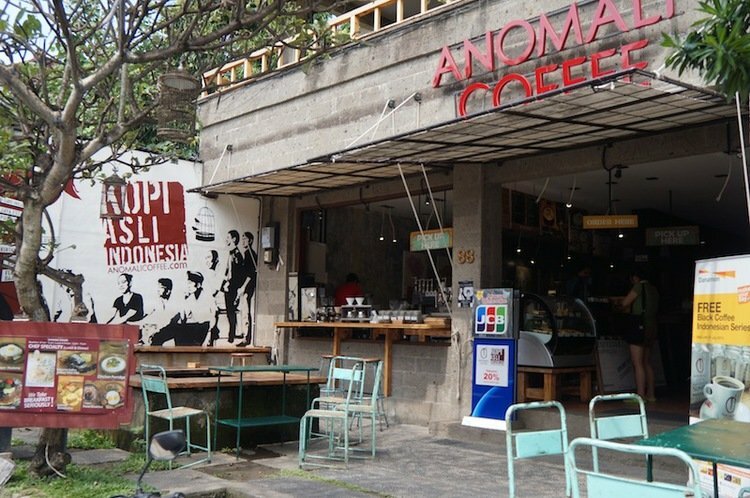 If you find yourself walking around after dinner in central Ubud, do head over to Anomali Coffee as they are one of the coffee joints in the area to close later. Their ice blended coffees are seriously deadly delicious on humid hot nights! Eggs benedict, hearty sandwiches, waffles, burgers and other forms of casual western fare are found all over Bali cafes to cater to the massive tourist crowd. Not only are they comparatively cheaper after tax and service charges but portions are generous. There’s no shortage of cafes serving up belly filling and wallet friendly meals all day long. 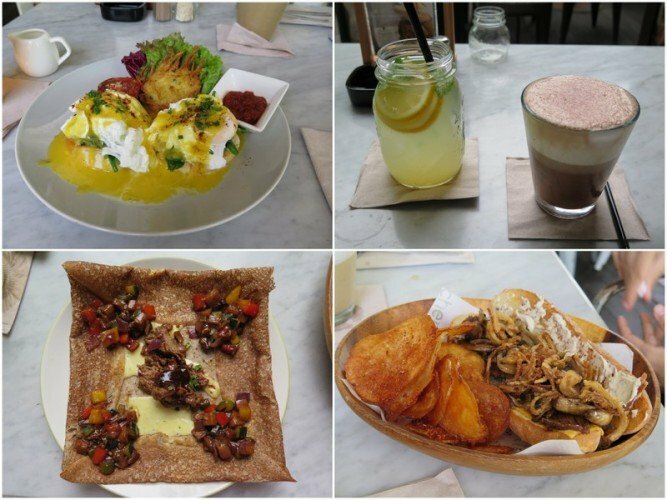 Enjoy a late morning brunch at any cafe or restaurant and expect a main and drink to cost no more than $8 – $10 SGD (78,000-100,000 IDR.). For all those dessert fanatics (especially girls), Bali is where it’s at! There’s an abundance of places to find gorgeous desserts throughout the island without burning a hole in your wallet. 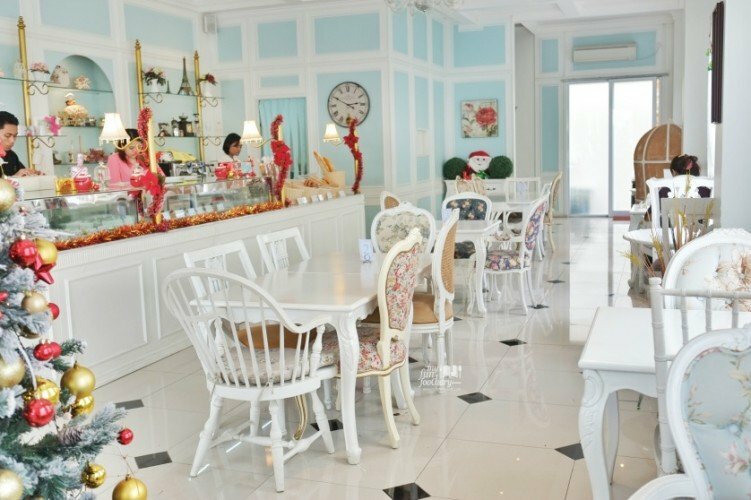 Expect small niche coffee shops, patisseries and more unusual and unique places where the desserts are all home made, affordable and delicious. A majority of these trendy eateries are located in Seminyak and Ubud. First time visitors, do at least take a day trip to these areas if you are staying elsewhere. 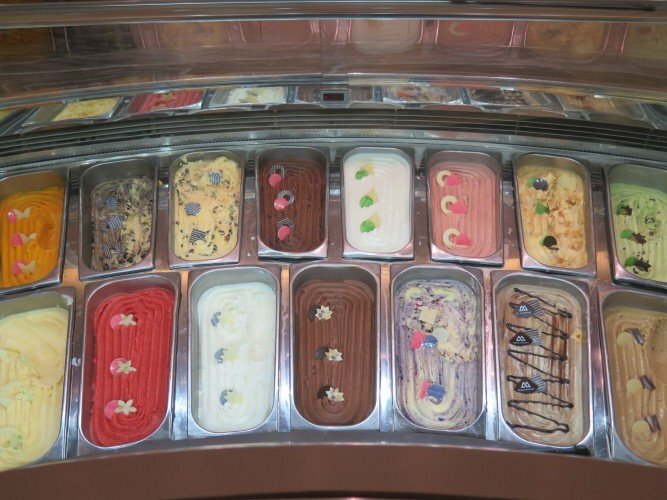 Who would’ve thought that house made ice creams, gelatos and sherbets would be a common sight in Bali? Most tourists would probably be looking to buy a cold drink or popsicle but would just as easily bump into a small gelateria or a cafe that produces their own ice creams. For those who strictly stick to chocolate or vanilla, it’s time to start expanding your palates with the huge variety of ice cream Bali offers. Be prepared to be spoiled by the range of flavor choices, as local ingredients such as red dragon fruit, lemongrass, lycee and soursop are also available. Various coffee, alcohol, chocolate and candy flavors are easily found too. Don’t be shy as you can easily try up to 4 flavors in one serving for less than $10 SGD (100,000 IDR.). In case you haven’t realized already, Balinese love their pork. Who could say no to ribs? Especially when its juicy, marinated, cooked over charcoal and served hot from the BBQ pit. Maybe it’s because you’re on holiday or maybe it’s the fact that charcoal grilled meat is the best. 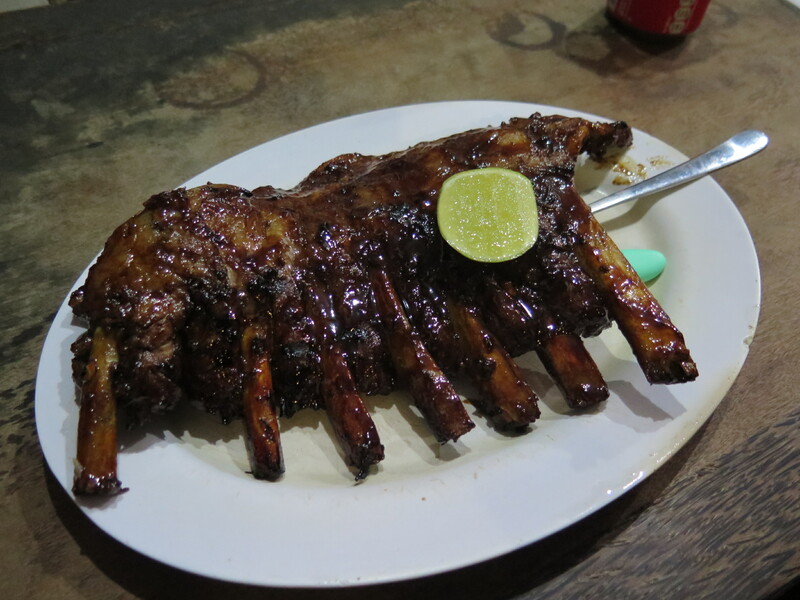 Bali has a few well-known places notorious for serving up some of the best ribs, steaks and grilled items. Naughty Nuri’s BBQ pork ribs are absolutely delicious. A full rack costing only 110,000 IDR. ($11 SGD). Slightly charred on the outside, a good balance of sweet, savory and just slightly smoky although the meat doesn’t fall of the bone like in an American smoke house but is still fantastic. Nonetheless if you’re a fan of BBQ meat make a point to make a rib-stop! Balinese deep fried duck or smoked duck are two variations of many traditional duck dishes. 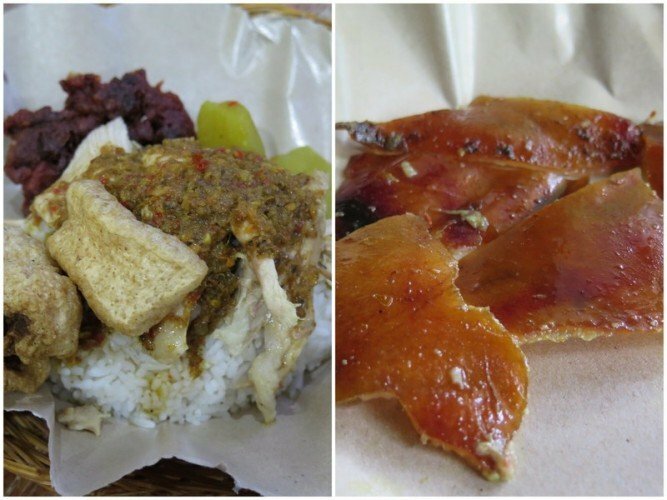 One consists of duck that has been seasoned and then steamed or boiled before being deep-fried (bebek goreng). The other has the duck wrapped and marinated with local seasonings and then smoked for 24 hours (bebek betutu). Expect the meat to be lean, flaking off the bone and incredibly tasty. All usually served with rice, sambals and local vegetable sides. Long established Bebek Bengil, or ‘dirty duck’ in English, is an established restaurant really does serve up some mean duck. Their portions are large and prices on the higher side but very reasonable in comparison to where the locals might dine. Their crispy duck is so crisp that although some may consider it borderline dry, if you enjoy your skin extra crispy to the point where small bones are crunchy treats you’ll love how Bebek Bengil does it. 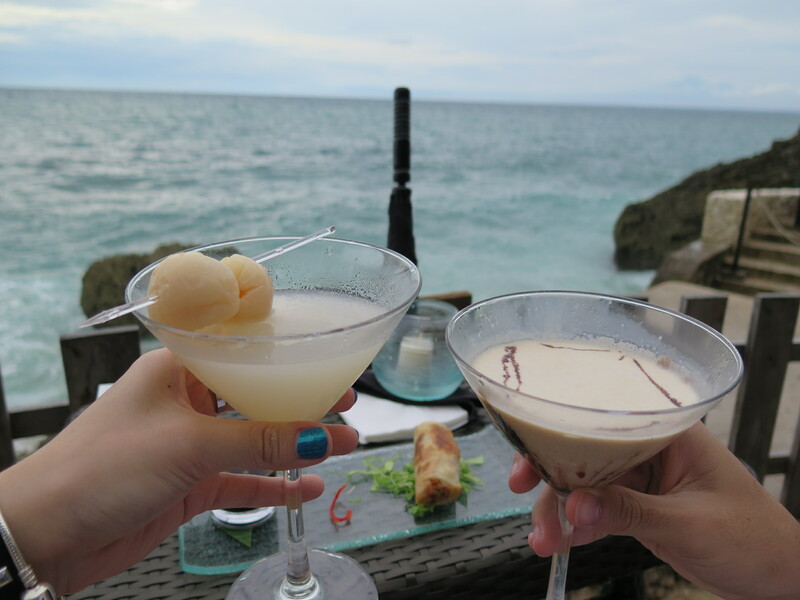 You are not officially on holiday until you’ve had your first cocktails. I love how affordable cocktails and plenty of happy hours make it appropriate all day and night to sip cocktails in Bali. Prices start as little as $5 SGD (50,000 IDR.) to an average of around $8-10 SGD (79,000 – 100,000 IDR.) for the more extravagant tipples. Cocktail menus in Bali tend to have at least 20 choices and are always served up with a smile from the always friendly locals. My favorite cocktails were ones drank from the rooftop bars in hotels along Kuta, a late night affair with a ‘Coconut Killer’ cocktail at Casa Luna in Ubud, and cocktails that came with the most amazing ocean view at the Rock Bar in Jimbaran. Considered a luxury in Singapore, it’s an experience worth indulging whilst in Bali on a Sunday. Where an alcoholic sunday brunch package would set you back between SGD $120 – $180++ in Singapore, the same is just around SGD $60 – $80++ at the higher end hotels in Bali. Brunch in a 4 or 5 star Bali hotel tends to have a more modest buffet spread with far more personal service, taking your brunch to another level. 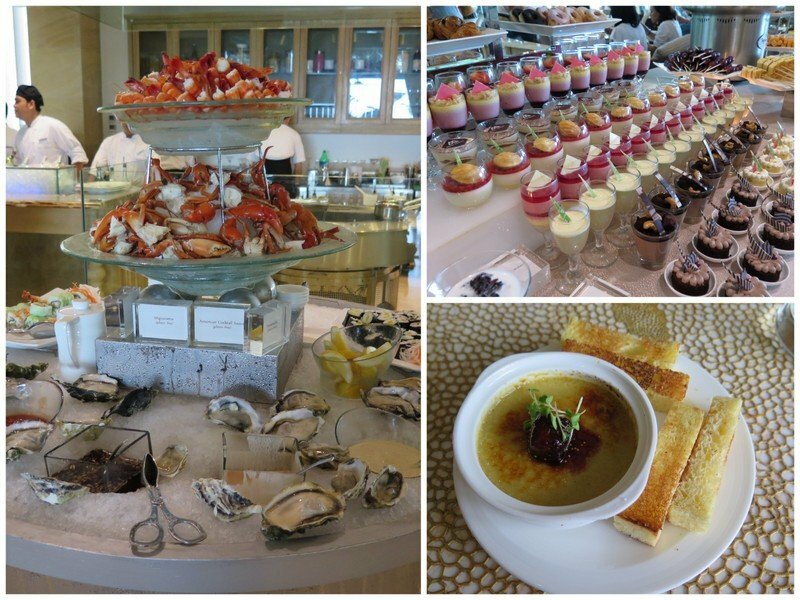 Sunday brunch at Soleil restaurant at The Mulia Resort in Bali is pretty incredible. You don’t only have a buffet spread to pick from but an ala carte menu to order freely from as part of the brunch experience. The chef also sends ‘special’ degustation items to your table throughout your meal. However, if you’d like to spend more conservatively, there are plenty of more budget friendly Sunday Brunches at the majority of hotels and restaurants around Bali. Jimbaran beach in Bali is famous for its long stretch of endless eateries serving up freshly grilled local seafood, while you face the ocean, feet in the cool sand, enjoy the breeze and watch the setting sun. Not only is it family, group and couple friendly, the majority of the eateries are incredibly affordable. Pick your seafood either ala carte by weight which will come with accompaniments for a complete meal or pick a set meal for groups of 2 to 20 people. Expect your seafood to arrive cooked just right, super fresh, juicy and covered in a bright red marinate which actually isn’t spicy at all but savory and sweet. Whatever your seafood preferences, a sunset dinner on Jimbaran beach should be on your checklist. HAVE YOU BEEN TO BALI? 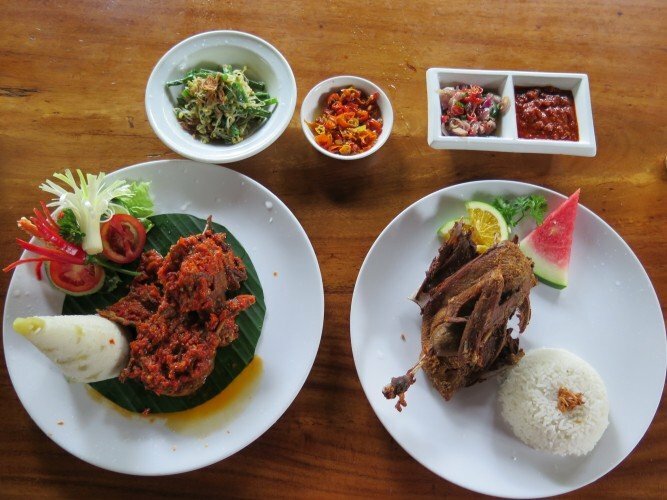 WHAT ARE YOUR FAVOURITE FOOD JOINTS IN BALI? Indonesia is an enormous nation. It’s really the fourth most populated nation on the planet, the world’s biggest island nation, and home to more than 18,000 islands. So going to Bali is just a small amount of what Indonesia brings to the table, make a point to look at other the awesome Indonesian goals. Spontie provides you best in class travel experience at really cheap prices, Now you can book amazing activities and things to do in Bali at last minute prices. Get Going Now !